This class represents a type for all functions. Note that covariant return types of virtual functions are permited in C++, thus this class has explicit support for the function return type and the original function's return type. Definition at line 71107 of file Cxx_Grammar.h. Constructor for building a function type. This is a const convience access function to the STL container of types in the child IR node (SgFunctionParameterTypeList* p_argument_list). This is a non-const convience access function to the STL container of types in the child IR node (SgFunctionParameterTypeList* p_argument_list). Reimplemented in SgPartialFunctionModifierType, SgPartialFunctionType, and SgMemberFunctionType. I forget why this is here. 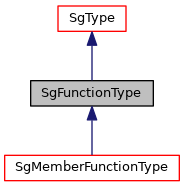 Cast function (from derived class to SgFunctionType pointer). This functions returns a SgFunctionType pointer for any input of a pointer to an object derived from a SgFunctionType. Returns valid pointer to SgFunctionType if input is derived from a SgLocatedNode. Returns valid pointer to SgFunctionType if input is derived from a SgFunctionType node.